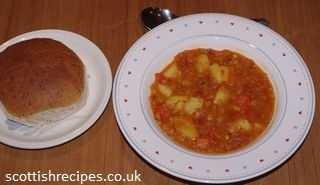 Eating in has a lentil and ginger soup served with naan bread. 1. Chop the vegetables finely. 2. Heat 1 teaspoon of oil and fry spices. 3. 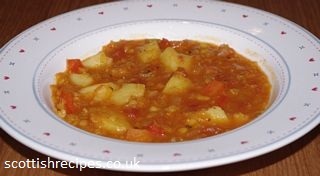 Add vegetables and lentils and stir and coat vegetables with spices. Cook for about 5 minutes. 4. Cut up tomatoes, put them in a measuring jug and add enough water or stock to make 1.2 litres. 5. Add this with basil and bay leaf to pan of vegetables. Bring to the boil and simmer for 40 minutes or until the lentils are cooked. 6. Add salt and pepper to taste. Add more water or stock if necessary. 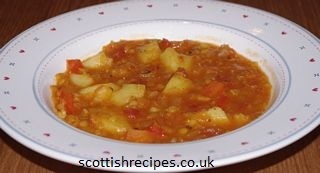 The Book Maw Broon's Cookbook has a more traditional Scottish lentil soup recipe which uses ingredients such as carrots, turnip. onions, potatoes and a ham hough. Buy Maw Broon's Cookbook at a discounted price and with free delivery available. 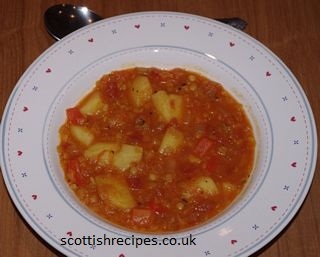 An alternative spicy lentil soup recipe can be found in Taste Ye Back: Great Scots and the Food That Made Them which includes ingredients such as crushed dried chillies, peppercorns and ham hock.